VC Poker starts new players off with a free seat in the weekly $1,000 New Player Freeroll. Additionally, all new players are eligible to join in the New Player Leaderboards and exclusive 10-Cent SNG Giveaways, during their first 3 months as real-money account holders. Also offered to new players is a generous 100% Deposit Bonus worth up to $500. To qualify, a newly signed member must enter the Bonus Activation Code (FULL500) when depositing a minimum of $10 up to a maximum of $500. The Bonus Dollars are released over the course of 45 days at a rate of $5 for every 500 Action Points accumulated. Since 1946, Victor Chandler have been a leader in U.K. bookmaking and gaming. They have brought their wealth of experience to VC Poker, the company’s downloadable poker room based on Playtech software licensed in Gibraltar. The poker games offered here are linked into Playtech’s French and Italian poker networks, but the primary language used is English and the basic currency unit is the U.S. dollar. The card rooms at VC Poker can only be accessed by downloading the web site’s exclusive poker application. No instant play or flash version is available. However, following installation, poker games can be practiced risk-free by using the application’s “Play for Fun” mode. Numerous freerolls are also available to new players, too. For the real money online poker games, account funding is required. Once an account has been established, the player has access to all of the scheduled tournaments and sit-and-goes offered by the site. These include competition in five major versions of poker: Texas Hold’Em, Omaha, Omaha Hi-Lo, 5-Card Stud, and 7-Card Stud. There is no limit to the number of games that can be played, and stakes are arranged to invite low limit play as well as no limit. Even though navigation of the web site is easy and needs no special training, for those starting out, VC Poker offers a free online “Poker School” that serves as a useful tutorial, not only for the software but also for the games. Information ranges from hand rankings and play to basic tournament strategies. VC Poker prides itself on community, customer service, and support. Supplements to the basic poker games here include a chat function, casino side games, buddy lists to help find friends online, and information on offline tournaments. In April 2010, the poker client software underwent a major upgrade, adding a resizable table function, new calendar views, and the capacity for note keeping during play. Action Points are heart of the VC Bet loyalty scheme. 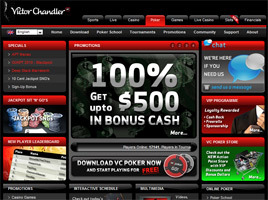 They are earned through play in real money cash games and tournaments, and can be exchanged for a broad range of free prizes and tournament tokens in the all new Victor Chandler Poker Store. Action Points can also be redeemed for free money and used to participate in guaranteed tournaments and freerolls in the Victor Chandler Poker card rooms. Action points per month also determine a player’s status in the Victor Chandler VIP Programme. All new players are automatically enrolled at the Garnet level. They progress upward through Amethyst and Sapphire to the higher ranks: Emerald, Ruby, and Diamond. At the very top are the 500-Carat Diamond members. The higher the level, the greater the benefits, from Store discounts and sports free bets to bonus dollars, vacations, live events packages, and cash back bonuses. The Poker Store offers players the opportunity to turn their Action Points into apparel, cameras, game consoles, iPods, Las Vegas holidays, and more. Points may also be redeemed here for tournament tokens, such as entries in the popular Fort Knox Jackpot Sit & Goes. Other promotions at VC Poker include the Bad Beat Bonanza and the Royal Flush Fortune, which award jackpots from a prize pool for obtaining certain hands in ring games. Additional Welcome Bonuses worth up to £175 can be claimed in VC Casino by poker players who enjoy the many casino side games on offer from the card-playing site.